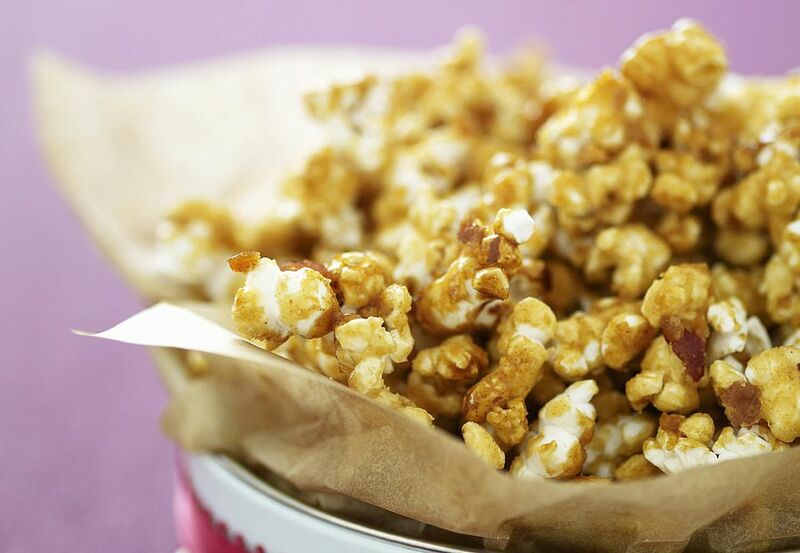 This caramel popcorn is baked to golden perfection at a very low temperature. The caramel corn is coated with a delicious brown sugar glaze. Make a double batch of this popcorn and watch it disappear! One reader added some cinnamon to the mixture and chocolate chips near the end of the cooking time. Make it with cashews or pistachios, or use the mixed nuts or peanuts. In a large roasting pan, combine the popped popcorn and nuts. Place the pan in the preheated oven while you prepare the glaze mixture. In a medium saucepan, combine the brown sugar, corn syrup, butter, and salt. Bring the sugar and butter mixture to a full boil over medium heat, stirring constantly. Continue to boil for 4 minutes without stirring. Remove from heat; stir in baking soda and vanilla, then pour over the warm popcorn and nuts; toss to coat the popcorn and nuts thoroughly. Return the popcorn to the oven and continue baking for another hour, stirring the mixture about every 10 minutes. Cool and break apart. Store in an airtight container.